See a woman—her profile dimly lit. This is the breath that stillness breathes. the long pulls on four taut strings. with gentle tremors on well-worn knees. This is the breath that beginnings breathe. set within the realm of arms entwined. or years—until the dance is done. Until the dancers part and cross the room. the eyes across burdened by a question. then straight across the floor again. of not knowing propels their legs. strike the silence after sound. Things dance in this world—circling round, as in a fugue. swim and dive, suspended in the deep—reach towards flight. as braided strains circle and give chase in a fugue. down, down, to indigo and quiet—beyond sound, voice. in my hand. Tightly, I hold on. Above me is only water. over salt tears and salt seas, or sweet rivers with their pebbles. of trees pronounce: Though we bury ashes, Spirit glides. comes back: now gravel-edged, then caught in humor’s flight. Can I still call? Will you come back, as the voices of a fugue? Water answers in endless progress, streaming over pebbles. Fingertips reach, skim the edge of riverbed and pick a pebble. free to wander over peaks. Free to meet me in the fugue. I will see you swim again—slow, steady—through the water. of birds, changing winds—all give your absence voice. on the soil perhaps, a lasting anchor to your final flight. among the worlds—of rock, of wind, of water. I pray to hear your voice again, woven in the fugue. through the dark, far river. Pebbles dance with water. We stretch towards flight, hear the strains of a fugue. Midway between four walls, I stand. trunks of spruce, larch, rowan, beech. Far above, a canopy of green, close knit. and when I turn, one more behind. I know the names of these two doors, do you? The one in front: let go. The one in back: hold on. What is this letting go? so they mean nothing anymore. Yet, here stand the doors, with their changeless names. a new shoot: bloom! Why don’t you? Now! Laura J. Braverman studied fine art and apparel design at Rhode Island School of Design, and worked internationally in apparel for many years. In addition to painting, she now focuses on writing, having completed a writer’s certificate in creative nonfiction with Stanford University. She worked with nonfiction writer Sven Birkerts at the Bennington College graduate writing seminars, has taken numerous courses in poetry and essay with the New School, and worked with poet James Arthur. 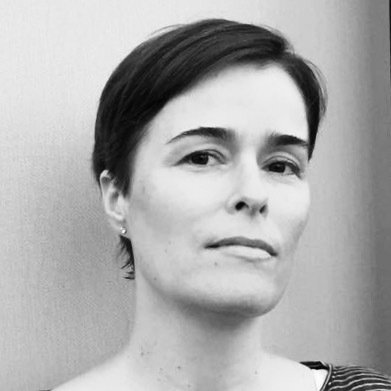 Her work has appeared in the prose anthology Mountain Stories, and the poetry journals Live Encounters, The BeZINE, Mediterranean Poetry, and is forthcoming in California Quarterly.